The 4 Strand Carbon Claw punch bag chain set helps to reduce the tension that is put on the straps of punch bags and as a result will increase the durability of your bag. The swivel fixture at the top of the set decreases the strain that is produced every time the punch bag swings and rotates. 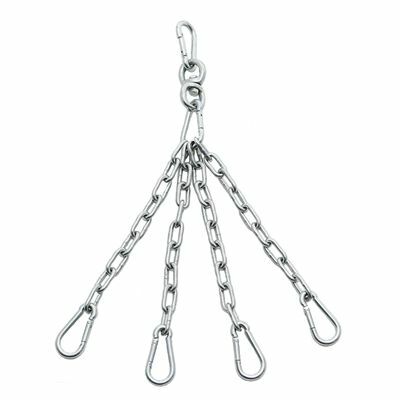 The steel chains are very strong and durable and each feature a snap lock fixing to attach to punch bags for a secure hold. for submitting product information about Carbon Claw Punchbag Chain Set - 4 Strand We aim to answer all questions within 2-3 days. for submitting product information about Carbon Claw Punchbag Chain Set - 4 Strand. We aim to answer all questions within 2-3 days. If you provided your name and email address, we will email you as soon as the answer is published. The chain length from the top of the hanging swivel to the bottom of 4 strand chains is 22 inches (560 mm). Chain length is 14 inches (356 mm), carabiner that holds chains in 8 inches long (204 mm). for submitting product review about Carbon Claw Punchbag Chain Set - 4 Strand.